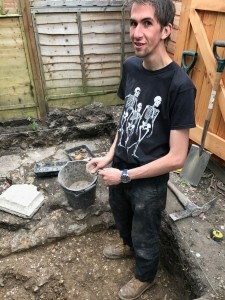 Two major surprise discoveries lit up the final hours of Hyde900’s Bank Holiday Weekend Community Dig (supported by WARG, the society for Winchester archaeology and local history) to shed new light on the history of Hyde and to solve a mystery linked to St. Bartholomew’s church. 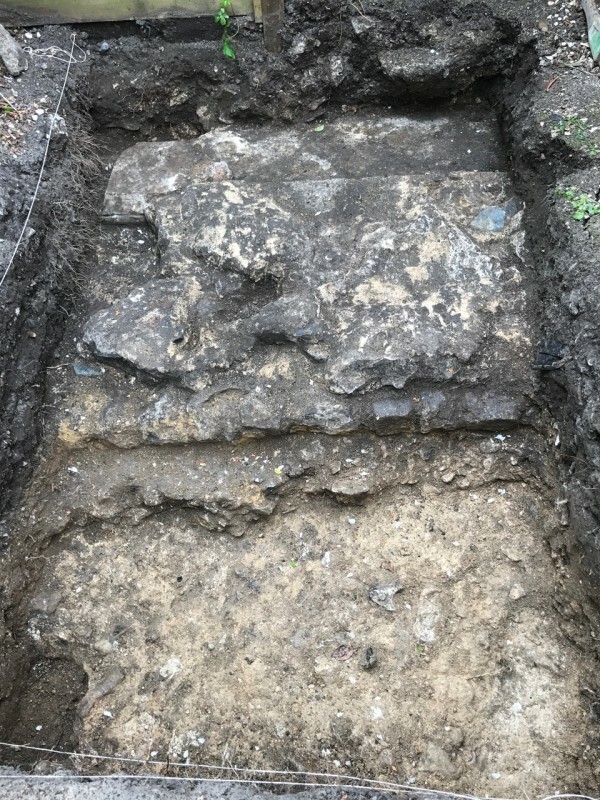 Excavations over the course of three days in the gardens of two houses in King Alfred Terrace covering what is believed to be the cloisters of Hyde Abbey had revealed a mass of building and other material dating back to the middle ages. However it wasn’t until the final day that startling conclusions were reached which could transform our understanding of this area of Winchester. The discovery also suggested that maybe the cloister was deliberately built on an area where previous buildings could be used as a base, said Mr Ashby. 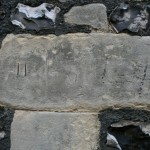 In other parts of the abbey site it was necessary to import a ‘raft’ of clay to provide stability. The second exciting discovery was of two Quarr stone ‘abacus’ fragments datable by their style to the first half of the 12th century. 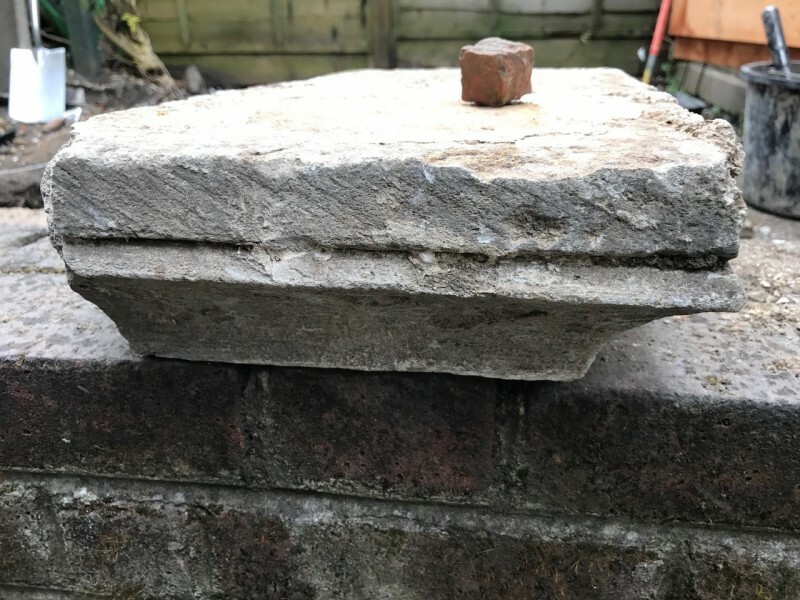 Originally thought to be plinths these were identified by Dr. John Crook (consultant archaeologist to Winchester Cathedral) as being, in fact, the load-bearing stones which are placed on the top of column capitals. Among the many visitors to the dig were the Mayor of Winchester, Councillor Jane Rutter, and Parliamentary candidate Steve Brine along with Fiona Mather, a candidate for the County Council elections. The open Visitors’ Day on Sunday attracted a constant throughput of people observing the dig including several TV crews. “I would like to pay tribute to the support and tolerance of the householders – Chris and Anne Prior and Justine Field – who permitted us access to their gardens,” said David Spurling. 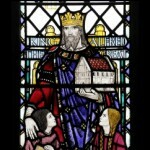 “They have been quite remarkable.” Justine was delighted by the experience. “This has been a dream come true for me,”she said. 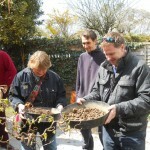 Interest in exploring what lies beneath the surface of their gardens is now becoming infectious in Hyde. Already there are five more families volunteering their properties and Hyde900 is looking forward to further community digs next year.